The next generation of flexible and transparent displays will require a high-performing and flexible polymeric material that has the optical and thermal properties of glass. The material must be transparent to visible light and have a low coefficient of thermal expansion (CTE). Unfortunately, such a polymeric material has not been available. 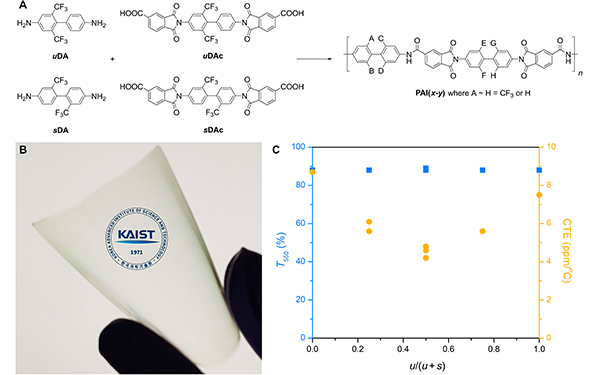 A KAIST research team has succeeded in making a new polymeric material with an exceptionally low CTE value while retaining high transparency and excellent thermal and mechanical properties. The method developed for amorphous polymers with a controlled CTE can be applied to control the thermal expansion of organic materials as well. Most of objects expands upon heating and shrinks by cooling, and organic polymers have a relatively large CTE compared to that of ceramics or metals. Thin, light-weight planar substrates for semiconductor devices should have a similar CTE of ceramics. Otherwise, the device can be cracked due to the stress caused by thermal expansion and contraction. Therefore, matching the CTE of the semiconductor device and the substrate is crucial for successful manufacturing of display devices. Forming a network structure by connecting polymer chains is a well-known method of reducing the CTE of amorphous polymers. However, polymers with a network structure eventually lose their flexibility and becomes brittle. As an alternative method, Professor Sang Youl Kim from the Department of Chemistry and his team chose to adjust the distance and interaction between polymer chains. Thermal expansion and contraction of polymer films can be minimized by introducing interaction forces between the polymer chains and by arranging the direction of the force perpendicularly. The team successfully implemented this approach by appropriately designing the chemical structure of a transparent polymeric material. It is called poly (amide-imide) film, which is a transparent, flexible, and high-performing polymeric material. It is thermally stable enough to be used in the AMOLED (active-matrix organic light-emitting diode) fabrication process (stable at >400℃) with a low CTE (4ppm/℃). 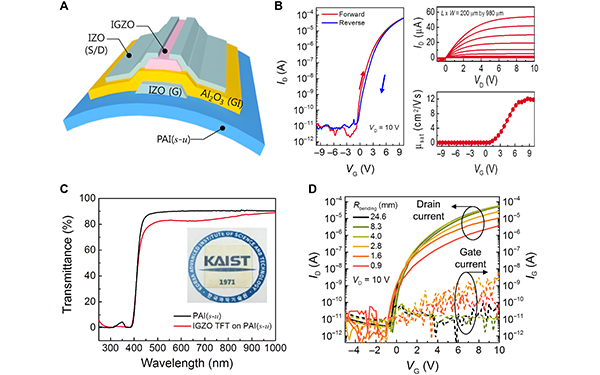 The team made IGZO TFT (Indium Gallium Zinc Oxide Thin Film Transistor) devices on the newly synthesized transparent poly(amide-imide) film, and confirmed that the device could indeed operate normally even when it is folded down to a radius of 1mm.